Sweating is most often associated with heat. You do sweat when exposed to high temperatures to help cool down. 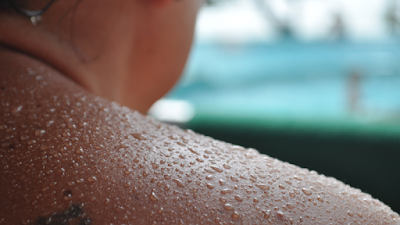 As sweat evaporates from your skin, it takes body heat away with it, producing a cooling effect thru thermoregulation. Some people sweat more in certain areas than others. Much of this is due in part to your DNA. Some individuals start to sweat in a particular area like their hands, feet or underarms because those particular glands react to the brain's signal first. This is also known as a Predisposition to sweating. Hyperhidrosis (excessive sweating) is a hereditary condition influenced by your genes. People that are leaner (skinny) tend to handle sweat more efficiently and handle heat better than overweight individuals. Fat acts as an insulator and because of this people with excess fat may feel hotter, sweat more profusely and take longer to cool down than a leaner person. The way your sweat glands are placed also shapes how you sweat. Your body contains roughly 2 to 5 million sweat glands located all across the body, which consist of two types: eccrine & apocrine. Eccrine glands reside in pores and produce sweat that is odorless and is composed of salt and water to help cool the skin. Apocrine glands typically end in hair follicles (rather than pores) and secrete a milky type fluid that becomes odorous when mixed with bacteria on the skin. If you sweat excessively in one particular area, you could have a higher concentration of eccrine glands there. Your body temperature will rise when you're active, so the more intense, the more you sweat. It is important to note that two people of a similar size can finish the same workout and sweat totally differently. It is true. As endurance builds up, your body becomes more proficient at sweating to keep you cool. Athletes for example sweat sooner and more heavily than untrained people because they have a higher maximum oxygen uptake which is a measure of cardiovascular fitness and aerobic endurance. This is the process of adjusting to environmental temperatures. When you regularly spend time in the heat, you become more acclimated to the temperature and sweat more efficiently. The ability to sweat is advantageous as it keeps you from overheating during a tough workout. Still, sweating excessively and spontaneously regardless of the temperature or physical activity can take a big toll on your life. Our Kleinert’s Sweatproof Undershirts completely absorb sweat while allowing it to evaporate. No more embarrassing wet marks or yellow stains shown by the underarms.